A 20-foot Christmas tree, put together by a father and son in Oregon, appears to poke through their one-story home on Christmas Eve, Dec. 24, 2016. 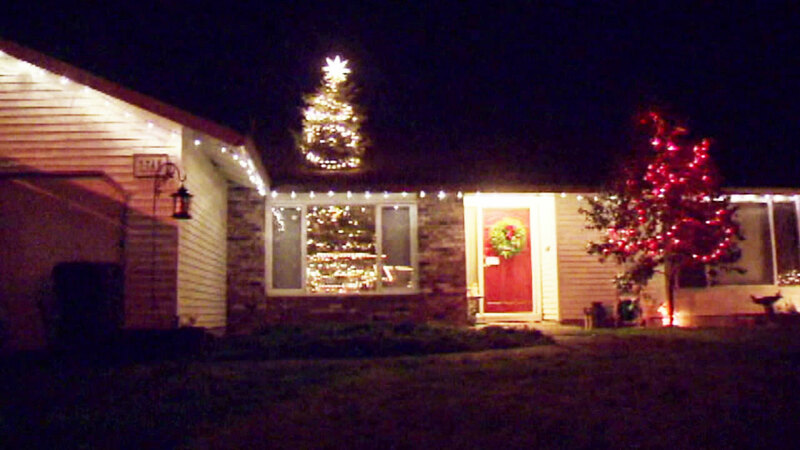 BEAVERTON, Ore. -- A father and son in Oregon decided to poke a little fun at their holiday season this year. Their 20-foot Christmas tree can be seen in their window and it appears to poke through the roof of their house. What many didn't see is the two actually cut it, put the top portion on the roof and decorated it with ornaments, lights and a shining star. The pair, Scott and Aidan Walters, got their inspiration from an unusual source. "I was just standing out here and I just looked up and I was like, 'What if the tree went through the roof? We have a one-story house and it would look pretty cool if it just seemed to bust through the roof and stuff.' We watch Christmas vacation a lot and it's kind of an inspiration with how big their tree is," they shared. The Walters now jokingly call themselves the Gris-Walters as a play on the Griswalds, which is the last name of the family in the film, "National Lampoon's Christmas Vacation."